Time is one of the things I think is most valuable to all of us, think about it, money you can always make more of, things you can just buy more of, food you can simply eat more of but time is gone forever once it’s passed. We can’t rewind time, as much as we may want to. 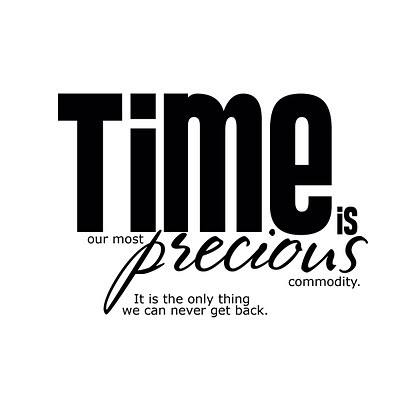 So, I think time for me is my most valuable commodity. Things I value most besides the actual minutes, are the times spent with family, friends, etc. Nothing will pick me up more when I’ve had a particularly tough or stressful week than my precious Sunday lunch with my family for example. I try to be on time most of the time. I value other people’s time as much as my own. It’s not always easy, people who know me, know the extreme work pressure I’m under at the moment with a growing business and franchising operation over and above all the usual pressures everyone else has. I’ve never been afraid of pressure, thriving under it within reason, so I take a lot on. I have a fairly full plate as it were, and yet, if I make an arrangement with you, it is unlikely I will break it or be late for it. It never ceases to amaze me when people who have a fraction of what I have going on going on are repeatedly late. It’s so disrespectful of my time and life. What amazes me more is people who are late but don’t apologise. They just act like everything’s okay. They give no thought to how their actions have affected your plans and day. Selfish. There is not other word to more accurately describe it! Disrespectful. When they continue to do this despite you telling them what an issue it is for you, they are simply saying you, your time and your feelings are worth less than theirs! Unacceptable. Is what it is to me!